The high variation of the influenza virus hemagglutinin (HA), particularly of its immunodominant head epitopes, makes it necessary to reformulate seasonal influenza virus vaccines every year. Novel influenza virus vaccines that redirect the immune response toward conserved epitopes of the HA stalk domain should afford broad and durable protection. Sequential immunization with chimeric HAs (cHAs) that express the same conserved HA stalk and distinct exotic HA heads has been shown to elicit high levels of broadly cross-reactive Abs. In the current mouse immunization studies, we tested this strategy using inactivated split virion cHA influenza virus vaccines (IIV) without adjuvant or adjuvanted with AS01 or AS03 to measure the impact of adjuvant on the Ab response. The vaccines elicited high levels of cross-reactive Abs that showed activity in an Ab-dependent, cell-mediated cytotoxicity reporter assay and were protective in a mouse viral challenge model after serum transfer. In addition, T cell responses to adjuvanted IIV were compared with responses to a cHA-expressing live attenuated influenza virus vaccine (LAIV). A strong but transient induction of Ag-specific T cells was observed in the spleens of mice vaccinated with LAIV. Interestingly, IIV also induced T cells, which were successfully recalled upon viral challenge. Groups that received AS01-adjuvanted IIV or LAIV 4 wk before the challenge showed the lowest level of viral replication (i.e., the highest level of protection). These studies provide evidence that broadly cross-reactive Abs elicited by cHA vaccination demonstrate Fc-mediated activity. In addition, cHA vaccination induced Ag-specific cellular responses that can contribute to protection upon infection. Current seasonal influenza virus vaccines can provide protection when they contain hemagglutinin (HA) surface glycoproteins that match those of the circulating virus strains (1). However, influenza viruses undergo constant changes in their surface glycoproteins because of a high mutation rate under host immune pressure (i.e., antigenic drift). These mutations allow the virus to escape preexisting immunity (2). Therefore, HA-based seasonal vaccines have to be reformulated and readministered on an annual basis (3), which requires a worldwide effort of surveillance to accurately predict the dominant circulating strains in the upcoming season. Furthermore, incorrect prediction or additional mutations can lead to a mismatch between the vaccine strain(s) and the circulating strain(s), which may result in poor vaccine effectiveness (4). High levels of HA head-specific neutralizing Abs usually correlate with protection from influenza virus infection. These Abs prevent the virus from attaching to host cell receptors or the fusion to the cell membrane by binding to the globular head domain of the HA molecule (5). However, the HA head domain is the main site of antigenic drift (6–8), which often renders these Abs ineffective. In contrast to the head domain, the HA stalk domain is relatively well conserved (9) but is not preferentially targeted by the immune response. Based on these data, a strategy has been developed that aims to focus the immune response toward the subdominant HA stalk domain rather than the immunodominant HA head domain by serially administering chimeric HAs (cHAs) (10–14). The cHAs are combinations of exotic head domains, mostly from avian influenza virus subtypes to which humans are naive, paired with the conserved HA stalk domain of interest. Sequential immunization with cHAs that have different head domains but the same stalk domain can redirect the immune response toward the conserved stalk domain (see Fig. 1A, 1B). When the immune system encounters an HA in a naive animal, it initially responds to the head domain, but some priming occurs against the stalk domain, as well. Exposure to another cHA with the same stalk but a different head boosts the immune response against the stalk domain, and this only induces a primary response against the head domain seen for the first time. By repeating this procedure, high Ab titers against the stalk are elicited. Further, because of the conservation of the HA stalk domains within influenza virus groups, anti-HA stalk Abs can react with a wide spectrum of influenza virus strains and subtypes. In previous studies in mice, we showed that vaccination regimens based on cHA split vaccines induce higher HA stalk-specific Ab titers than a seasonal influenza virus vaccine and that the anti-HA stalk Ab responses are long-lasting, cross-reactive to distantly related HAs, and provide protection in vivo in a serum passive transfer/viral challenge model (15). Recently, in a ferret study, we saw superior protection in animals that received cH8/1N1 live attenuated influenza virus vaccine (LAIV) followed by adjuvanted cH5/1N1 inactivated split virion cHA influenza virus vaccine (IIV) compared with adjuvanted or nonadjuvanted cH8/1N1 IIV followed by cH5/1N1 IIV, which could not be solely explained by Abs (13). Innate immune responses and/or cellular immune responses could be responsible for the observed differences in protection. The importance of T cells in protective responses against influenza infection has previously been described; they have been shown to be critical to clear viral infections and to play a role in reducing symptom severity, duration of illness, and viral shedding (16, 17). T cells are also important for bystander help to other T cells and B cells. As such, they are required for Ab class switching. 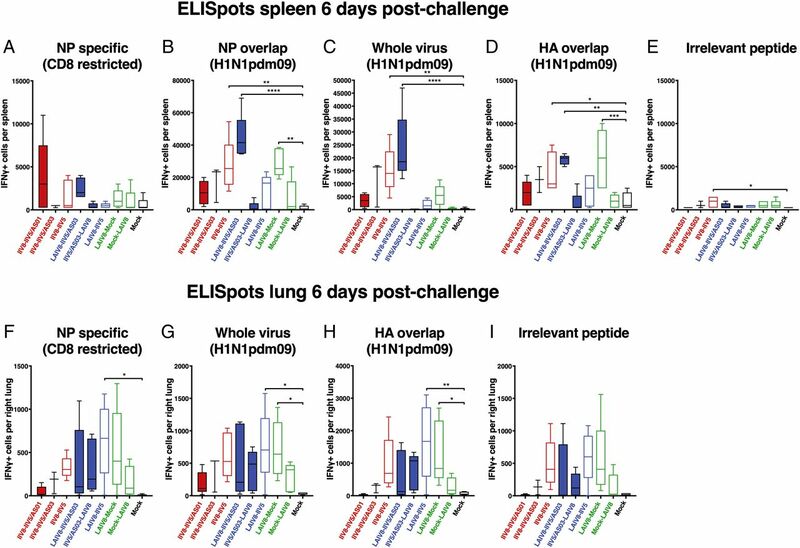 T cells can recognize epitopes derived from highly conserved internal virus proteins in the context of MHC and, therefore, can be activated against a wide variety of influenza virus subtypes (18, 19). Hence, this cellular immunity can also contribute to protection against newly emerging virus strains for which the preexisting Ab titers may be very low. In this study, we aimed to further explore the cHA strategy in mice by comparing the use of two different adjuvants, assessing the functionality of the anti-HA stalk domain Abs and their cross-reactivity, and evaluating the cHA order on the Ab responses in mice experimentally primed with a quadrivalent inactivated vaccine (QIV). Another objective of the studies was to analyze the levels of influenza virus–specific IFN-γ–secreting cells elicited by cHA immunization before and after influenza virus infection, comparing IIV and LAIV immunization regimens. The investigational monovalent cH5/1N1 and cH8/1N1 egg-derived, inactivated, split virion vaccines (hereafter referred to as inactivated split virion cH5/1N1 vaccine [IIV5] and inactivated split virion cH8/1N1 vaccine [IIV8], respectively) were produced from cH5/1Cal09N1Cal09 and cH8/1Cal09N1Cal09 viruses as described previously (20, 21). The H5 head domain of cH5/1Cal09N1Cal09 virus was derived from the HA of A/Vietnam/1203/04 (H5N1), the H8 head domain of cH8/1Cal09N1Cal09 virus was derived from the HA of A/mallard/Sweden/24/02 (H8N4), the HA stalk domain and neuraminidase (NA) of both viruses were derived from A/California/04/09 (H1N1), and the internal genes were derived from the high-yielding vaccine donor strain A/Puerto Rico/8/34 (H1N1) (PR8). IIV8 and IIV5 were produced at GlaxoSmithKline (Dresden, Germany) following the same production process as the one used for monovalent bulks that are combined into a licensed inactivated split virion seasonal vaccine (22). They were freeze-dried and supplied as a sterile lyophilized powder. The live attenuated vaccine (hereafter referred to as LAIV8) was produced using a cold-adapted A/Leningrad/134/17/57 master donor virus expressing cH8/1Cal09N1Cal09 (as described above), and it was rescued and grown in eggs at 33°C for 72 h. Infected eggs were chilled to 4°C for 3 h, harvested, and clarified by 0.22-μm filtration (EMD Millipore). Viruses were titrated by plaque assay on Madin–Darby canine kidney (MDCK) cells in the presence of tosyl phenylalanyl chloromethyl ketone-treated trypsin. The licensed seasonal egg-derived 2016–2017 Northern hemisphere QIV, produced by GlaxoSmithKline, was composed of A/Christchurch/16/10 (H1N1), A/Hong Kong/4801/14 (H3N2), B/Brisbane/60/08, and B/Phuket/3073/13 strains. For the mouse challenge studies following serum transfer and direct challenge, the A/Netherlands/602/09 (H1N1) strain H1N1pdm09 or a PR8-reassortant expressing a cH6/1 HA (HA head from A/mallard/Sweden/81/02 [H6N1], HA stalk domain A/California/04/09 [H1N1]) and an N5 NA (from A/mallard/Sweden/86/03 [H12N5]) were used. The strains were grown in 8–10-d-old embryonated chicken eggs at 37°C for 48 h.
AS03 is an oil-in-water emulsion-based Adjuvant System (GlaxoSmithKline) containing 11.86 mg of α-tocopherol, 10.68 mg of squalene, and 4.86 mg of polysorbate-80/0.5 ml (23). It was provided as a monodose prefilled syringe. AS01 is a liposome-based Adjuvant System (GlaxoSmithKline) containing the immunostimulants 3-O-desacyl-4′-monophosphoryl lipid A (MPL) and Quillaja saponaria Molina, fraction 21 (QS-21; licensed by GlaxoSmithKline from Antigenics, a wholly owned subsidiary of Agenus) (24). AS01 was provided as a monodose vial containing 50 μg of QS-21 and 50 μg of MPL/0.5 ml. The cHA split virion vaccines were admixed with the AS03 or AS01 by gentle inversion preceding each immunization. Only for the Ab study, AS01 was first diluted with an equivalent volume of phosphate-buffered diluent (pH 7.2). Consequently, the concentrations of MPL and QS-21 in the administered vaccine were 25 μg of each/0.5 ml. All mouse procedures performed were approved in advance by the respective overseeing committees (local GlaxoSmithKline ethical committee or Icahn School of Medicine at Mount Sinai Institutional Animal Care and Use Committee) in accordance with the local guidelines (European Directive 2010/63/EU and the GlaxoSmithKline Vaccine policy on the care, welfare and treatment of animals, Animal Act PL99–158 [as amended], and guidelines stated in the “Guide for the Care and Use of Laboratory Animals,” respectively). Six-to-eight-week-old female BALB/c (BALB/cAnNCrl; Charles River Laboratories) or C57BL/6 mice (Charles River Laboratories) were used for the experiments as indicated below. Mice were arbitrarily assigned to study groups and had free access to food and sterilized tap water. Groups of 40 BALB/c mice were primed i.m. on day 0 with QIV (50 μl/dose, 1.5 μg of HA/strain, equivalent to a one tenth of a human dose) and immunized on day 28 with 1.5 μg of HA of either IIV5 or IIV8 and then again on day 56 with IIV8 or IIV5, respectively, unadjuvanted or adjuvanted with 50 μl of either AS01 or AS03. Control groups were vaccinated twice with QIV or injected three times with PBS (only 20 BALB/c mice were immunized with PBS). Blood was collected on day 0, day 28 (28 d postpriming), day 56 (28 d after first immunization), and day 84 (28 d after second immunization). Recombinant cH6/1 (head domain from HA of H6N1 virus A/mallard/Sweden/81/02, stalk domain from HA of H1N1pdm09 virus A/California/4/09), full-length H2 (A/mallard/Netherlands/5/99), H9 (A/chicken/Hong-Kong/G9/1997), H18 (A/flat-faced bat/Peru/033/10) HA, and N1 NA (A/California/04/09) baculo-derived recombinant proteins (25, 26) were used as ELISA coating Ags. The serum samples were generally pooled for ELISA analysis (Figs. 3–5) and tested in technical triplicates. In addition, to test statistical significance of the differences in Ab titers, individual serum samples from day 84 postpriming were tested for reactivity against cH6/1 and H9 HA. High-binding 96-well ELISA plates (Thermo Scientific) were coated with 50 μl of Ag diluted at a concentration of 2 μg/ml in coating buffer (Kirkegaard & Perry Laboratories). The plates were incubated for 12–18 h at 4°C, and the coating solution was removed with three washes of PBS containing 0.1% Tween-20 (PBS-T), pH 7.4. The plates were blocked with 220 μl of blocking solution (PBS-T with 3% goat serum [Life Technologies] and 0.5% milk powder)/well for 1 h at room temperature. The blocking solution was replaced with 100 μl of fresh blocking solution/well. An additional 90 μl of blocking solution for 2-fold dilutions and 40 μl for 3-fold dilutions were added to the first well of each dilution series. Ten microliters of prediluted serum was added to the first well of each dilution series. Fifty or one hundred microliters was transferred for 3-fold or 2-fold serial dilutions, respectively. Two columns per plate did not contain any serum and were used as blanks. The plates were incubated for 2 h at room temperature and then washed three times with PBS-T. HRP-labeled anti-mouse IgG (A9044; Sigma), anti-mouse IgG1 (ab97240; Abcam), or anti-mouse IgG2a (ab97245; Abcam) were used as secondary Abs. Fifty microliters of secondary Ab, diluted 1:3000 in blocking solution, was added to each well, and the plates were incubated for 1 h at room temperature. The plates were washed four times and developed with 100 μl of SigmaFast OPD (Sigma) substrate/well for 10 min. Enzymatic color development was stopped with 50 μl of 3 M hydrochloric acid/well, and the plates were read at an absorbance of 490 nm. The area under the curve values were calculated in GraphPad Prism using a standard cutoff of 0.075. The average of blank values plus 3 SD was calculated for each plate, and plates that exceeded a value of 0.075 were repeated. Individual sample ELISAs were run on all samples for which sufficient serum volumes were available from the day 84 volume after serum pools were generated. MDCK cells (2 × 105 cells/ml in complete DMEM and 100 μl/well) were seeded in white polystyrene 96-well assay plates (Costar Corning). Plates were incubated overnight at 37°C, 5% CO2. Viruses were diluted to a multiplicity of infection (MOI) of 2 per 100 μl in UltraMDCK media (Lonza). Cells were washed with PBS and infected with MOI = 2 of chimeric H6/1N5 virus expressing an H6 head domain (H6N1 virus A/mallard/Sweden/81/02) in combination with an H1 stalk domain (A/Netherlands/602/09) and an N5 NA (A/mallard/Sweden/86/2003 [H12N5]) or with MOI = 2 of wild-type H1N1pdm09 (A/Netherlands/602/09) virus. Plates were incubated overnight at 37°C, 5% CO2. Cells were washed with PBS, and 25 μl of 2-fold serially diluted mouse pooled sera was added. The same volume of murine FcγRIV Ab-dependent cellular cytotoxicity (ADCC) bioassay effector cell solution (1.25 × 105 cells/ml; Promega) was added to the wells. Finally, also 25 μl of RPMI 1640 media (Life Technologies) was added. Plates were incubated for 6 h at 37°C, 5% CO2. Cross-linking of mFcγRIV by immune complexes results in luciferase activity, which is measured by the addition of 75 μl of Bio-Glo Luciferase substrate (Promega). Luminescence was read after 15 min with a Synergy H1 hybrid multimode microplate reader (BioTek). Background luminescence (average plus 3 × SD) of wells without Ab was subtracted, and the area under the curve was calculated. To evaluate the functionality of anti-H1 stalk-specific Abs by passive transfer (in vivo), a minimal volume of 10 ml of serum per group was needed. To reach this 10 ml of serum/group, a sample size of 40 mice per group was used. For the PBS group (negative control for the experiment), a lower number of animals was used (n = 20). For the passive transfer experiment, 150 μl of pooled mouse sera (day 84) from each cHA group, the QIV control group, and the PBS control group was injected i.p. into naive BALB/c mice. For the H1N1pdm09 challenge, because of the low amount of serum from the PBS control group, serum from the PBS control group was injected i.p into five naive mice, and PBS was injected i.p. into five other naive mice. Two to five hours after serum transfer, the mice were sedated with a ketamine/xylazine i.p. injection and were challenged with 10 × LD50 (150 PFU) of wild-type H1N1pdm09 (A/Netherlands/602/09) virus or 10 × LD50 (20 PFU) of cH6/1N5 virus by intranasal (i.n.) administration of 50 μl of virus preparation diluted in PBS. The cH6/1N5 virus had an exotic HA head (H6) and an NA (N5) to which the vaccinated mice were immunologically naive, but the Abs in the transferred sera will recognize the conserved H1 stalk of the virus. Body weight was monitored daily for up to 14 or 16 d. Mice that lost more than 25% of their initial body weight following viral challenge were euthanized for ethical reasons and were considered as mortalities. All prechallenge serum samples were tested for reactivity to cH6/1 Ag by ELISA. Animals that received postvaccination serum but showed no reactivity in the ELISA were excluded from further analysis because the serum transfer was considered unsuccessful. Eight groups of 10 C57BL/6 mice were primed on day 0 with an i.m. injection of QIV. Then, three groups received i.m. injections of either IIV8 followed by IIV5, IIV8/AS03 followed by IIV5/AS03, or IIV8/AS01 followed by IIV5/AS01 on days 28 and 56. Three other groups were i.n. immunized with 105 PFU of LAIV8 followed by either IIV5, IIV5/AS03, or an i.n. mock immunization with allantoic fluid. Two remaining groups were given either IIV5/AS03 or allantoic fluid on day 28, both followed by 105 PFU of LAIV8 on day 56. Finally, a mock control group received i.m. injections of PBS on day 0, allantoic fluid i.n. on day 28, and AS03 only on day 56. Blood was collected on days 28 (28 d postpriming), 56 (28 d after the first immunization), and 84 (28 d after the second immunization). Previous T cell kinetics studies (including internal pilot studies) suggested that T cell responses are highest around the 10-d postvaccination/infection time point in mice without preexisting immunity (27–29). Thus, on day 66 (10 d after the last immunization), five mice per group were euthanized, and tissues were collected to measure postimmunization T cell responses. On day 84, the remaining five mice per group were challenged with 5 × LD50 of H1N1pdm09 virus. Six days after the challenge, tissues were collected to measure T cell responses and viral titers in the lung. Day 6 postinfection was selected because T cell recall responses in vaccinated animals were expected to exhibit faster kinetics, while no early de novo T cell induction would be observed in mock vaccinated animals at this time point. Direct viral challenge was performed on C57BL/6 mice on day 84. The mice were sedated with an i.p. ketamine/xylazine injection and were challenged with 5 × LD50 (75 PFU) of wild-type H1N1pdm09 (A/Netherlands/602/09) virus by i.n. administration of 50 μl of virus preparation diluted in PBS. Body weight was monitored daily for 6 d following challenge until mice were euthanized to measure lung virus titers and cellular immune responses. Left lung lobes were removed aseptically and homogenized in 0.3 ml of PBS in a Benchmark BeadBlaster24. The homogenates were centrifuged (15 min, 16,100 × g, 4°C) to remove cellular debris and stored in single-use aliquots at −80°C. Titers of infectious virus were determined by plaque assay. Briefly, 250 μl of 10-fold dilutions of lungs homogenized in PBS were used to infect confluent monolayers of MDCK cells. Virus was allowed to attach to MDCK cells for l h at 37°C. Cells were washed once with PBS and overlayed with oxoid agar (Oxoid) prepared using NaHCO3-buffered serum-free 2× MEM/BSA containing DEAE dextran and supplemented with tosyl phenylalanyl chloromethyl ketone-treated trypsin. Cells were incubated at 37°C for 48 h. PFU were determined by visualizing virus plaques 2 d postinfection by staining with polyclonal serum, followed by HRP-conjugated sheep-derived anti-mouse serum (GE Healthcare) and TrueBlue substrate (KPL-Seracare). Whole lungs and spleens were isolated aseptically 10 d after the last vaccination (n = 5 mice per group), or right lung lobes and spleens were isolated aseptically 6 d after challenge (n = 5 mice per group). Lung tissue was cut into pieces of ∼l mm3 in size and digested with type IV collagenase (Worthington) for 30 min at 37°C. Single-cell suspensions of spleens and digested lungs were prepared by forcing tissue over a 70-μm mesh cell strainer (Corning). RBCs were lysed in spleen and lung cell suspensions by resuspension of cells in 5 ml of NH4Cl solution. Lung cells were further enriched by centrifugation of lung cell suspensions (400 × g for 5 min) in 33% Percoll Plus (GE Healthcare). T cell analysis was performed according to the immunoplate manufacturer’s protocol (R&D Systems). Briefly, 96-well immunoplates precoated with sterile monoclonal anti–IFN-γ Abs were blocked with culture medium (RPMI 1640 supplemented with 10% FCS, l-glutamine, and antibiotics). Cells were resuspended in a predetermined volume of culture medium that correlates with ∼105 cells/100 μl (5 ml/spleen, 450 μl/total lung postvaccination) or 105 cells/50 μl (450 μl/right lung lobes postchallenge) and were transferred to peptide- or whole virus–coated plates. Exact cell counts of the cell suspensions were measured in parallel using a Gallios flow cytometer (Beckman Coulter) operated with Kaluza software. High-pressure liquid chromatography–purified (>95% purity) H2b-restricted epitope-specific peptides (influenza virus nucleoprotein [NP]-derived ASNENMETM and human papillomavirus E7-derived RAHYNIVTF irrelevant peptide) were purchased from Anaspec (Fremont, CA). Pools of 15-mer peptides with 11 aa overlaps spanning either the influenza virus NP or HA protein of A/California/4/09 (H1N1pdm09) virus were obtained from Miltenyi Biotec (Cambridge, MA) and used at the dilution recommended by the manufacturer. A/Netherlands/602/09 virus (H1N1pdm09) was used at 104 PFU/well for overnight restimulation. Plates were then washed, and IFN-γ was detected by a biotinylated polyclonal anti–IFN-γ antiserum. 5-Bromo-4-chloro-3-indolyl-phosphate/NBT chromogen substrate for alkaline phosphatase conjugated to streptavidin resulted in the formation of spots at places where immune cells secreted IFN-γ during peptide restimulation. The spots were counted using an ImmunoSpot S6 Micro Analyzer (Cellular Technology) with ImmunoCapture 6.4 software (Cellular Technology), and results were expressed as the number of spots per organ. For samples that resulted in too many spots, automated quantification was not possible, and the values were arbitrarily set to the upper limit of quantification. Individual ELISA results were analyzed using a one-way ANOVA approach comparing all groups to the QIV–QIV group, followed by a Dunnett posttest to adjust for multiple comparisons. IgG2a/IgG1 ratios were analyzed using a one-way ANOVA approach comparing all groups to each other, followed by a Tukey posttest to adjust for multiple comparisons. ELISPOT and viral titers results were analyzed using a one-way ANOVA approach comparing all groups to the mock control group, followed by a Dunnett posttest to adjust for multiple comparisons. ELISPOT and viral titer results were analyzed using a one-way ANOVA approach comparing all groups to the mock control group, followed by a Dunnett posttest to adjust for multiple comparisons. To expand on our previous studies that tested cHA vaccination strategies in mice, an immunogenicity study was designed to assess the impact of different adjuvants as well as the order of Ags on the induction of cross-reactive Abs (Fig. 1). BALB/c mice were chosen for the Ab studies to allow comparisons to previously generated data. Mice that received a prime with nonadjuvanted QIV were boosted with either IIV8 followed by IIV5 or with IIV5 followed by IIV8. The booster vaccine doses were injected without adjuvant or adjuvanted with either AS01 or AS03 (Fig. 2). The purpose of QIV vaccination was to prime mice with an HA stalk-specific immune response that is present in humans who have been previously exposed to influenza Ags either through vaccination and/or infection (30). A standard-of-care control group that received a second dose of QIV was included to represent the Ab response elicited by current licensed vaccines. Mice that received three doses of PBS were used as a negative control. Chimeric HA-based universal influenza virus vaccine concept. (A) Humans are repeatedly exposed to circulating H1N1 influenza viruses by infection or vaccination. Such repeated exposure induces Abs against the immunodominant HA head domain. (B) By using chimeric influenza Ags sharing the same H1 stalk but different HA head domains (pictured in blue and pink), the immune response can be redirected toward the otherwise immuno-subdominant HA stalk epitopes. The immunosilencing of the HA head also allows redirecting of the immune response to other immuno-subdominant domains of the virus (including the NA; not shown here). Experimental design for serological analyses. BALB/c mice were experimentally primed with QIV on day 0, followed by IIV8 on day 28 and IIV5 on day 56 or IIV5 on day 28 and IIV8 on day 56. IIV Ags were adjuvanted with AS01 or AS03 or administered nonadjuvanted. Control groups consisted of two injections of QIV (standard of care) or three injections of PBS. Blood samples were collected on days 0, 28, 56, and 84. Anti-H1 stalk Abs were measured by ELISA using a recombinant cH6/1 HA protein (that contains an HA head domain that the animals were not exposed to). Boosting with adjuvanted cHA, both IIV8–IIV5 and IIV5–IIV8 induced higher levels of HA stalk-specific Abs compared with two doses of QIV, as measured both on pooled sera at each time point (Fig. 3A) and on individual sera on day 84 (Fig. 3B). These results were consistent with previous studies and confirmed the validity of the cHA concept to elicit HA stalk-specific Abs. Importantly, although the standard-of-care control group only received two doses of QIV (recommended for naive individuals), a previous study showed that three doses of both adjuvanted or nonadjuvanted QIV elicited lower HA stalk-specific Ab titers compared with cHA vaccination (15). AS01 and AS03 increased the levels of Abs ∼10-fold compared with the nonadjuvanted formulations (Fig. 3A, 3B). No differences in the magnitude of the Ab responses induced by AS01-adjuvanted vaccines versus AS03-adjuvanted vaccines were observed. After priming with QIV, BALB/c mice were immunized with different formulations, as described in Fig. 2, and the levels of elicited anti-H1 stalk IgG were measured by ELISA in sera collected at different time points. A recombinant cH6/1 HA was used as an Ag to measure H1 stalk Abs. (A) Ab titers in pooled sera are shown over time on days 0, 28 (postpriming), 56 (after first immunization), and 84 (after second immunization). (B) Mean Ab titers in individual sera on day 84 are shown. Each symbol represents one mouse. ****p < 0.0001. The breadth of cross-reactivity of these Abs was evaluated by performing additional ELISAs using HAs that are more or less distantly related to H1 (i.e., H2, H9, H18, and H3) (see Fig. 4A). Ab responses to H2 and H18 stalk domains followed the same pattern as the responses to H1 (Fig. 4B, 4C). However, the responses to H18, which is distantly related to H1 within influenza group 1, were 10-fold lower than the responses to H2, more closely related to H1. Interestingly, a trend for higher H9-reactive Ab titers was observed in the groups that received IIV8 as the first cHA immunization, compared with the groups that received IIV5 as the first immunization (Fig. 4D, 4E). H8 and H9 (head domain for IIV8) are in the same phylogenetic clade and may share an epitope in the HA head domain, which could be responsible for the cross-reactivity. The groups that received IIV8 last did not induce the same level of cross-reactivity, which could indicate an imprinting effect that depends on the vaccination sequence. Curiously, IIV5 vaccination did not have a similar effect on H2 Abs, despite a similar phylogenetic relatedness between the strains. Cross-reactivity of the anti-H1 Abs. (A) HA phylogenic relationship between the different evaluated subtypes. Mice were immunized with a vaccine containing the HA stalk domain of H1, and cross-reactivity of the elicited Abs was evaluated in pooled sera to full- length H2 (B), H18 (C), H9 (D), and H3 (F) HAs. The reactivity to H9 HA was also measured in individual mouse sera (E). Bars are means. *p < 0.05, ****p < 0.0001. The levels of N1-reactive Abs are shown in (G). To test if cHA vaccination with H1 stalk-expressing Ags would also boost Abs against group 2 HAs, ELISAs against H3 were performed. H3-reactive Abs were elicited by QIV vaccination but were not further boosted by cHA-based immunization (Fig. 4F). This highlights the requirement of a multivalent vaccine to elicit universal protection against group 1 as well as group 2 strains of influenza viruses. Ab levels against N1 NA were overall low but were slightly boosted by repeated vaccinations (Fig. 4G). To further characterize the immune response elicited by cHA-based immunization, IgG1 and IgG2a Ab responses to the HA stalk were evaluated. IgG1 Ab levels mirrored the findings for total IgG, with higher levels elicited by adjuvanted vaccines and comparable titers for AS01- and AS03-adjuvanted vaccination groups (Fig. 5A, 5B). However, groups that received AS01-adjuvanted cHA Ag had higher levels of HA stalk-specific IgG2a Abs compared with groups that received Ag formulated with AS03 or without adjuvant (Fig. 5C, 5D). This also translated to higher IgG2a/IgG1 ratios in the two cHA groups formulated with AS01, in both pooled (Fig. 5E) or individual sera (Fig. 5F), which is indicative of a more Th1-focused response as a result of using AS01 as the adjuvant. Anti-H1 stalk IgG1 and IgG2a titers. After priming with QIV, BALB/c mice were immunized with different formulations, as described in Fig. 2, and the levels of elicited anti-H1 IgG1 and IgG2a were measured by ELISA in sera collected on day 84 (after second immunization). To measure H1 stalk Abs, a recombinant cH6/1 HA was used as an Ag for ELISA. In (A) and (C), the levels of IgG1 and IgG2a are shown, respectively, expressed as the absorbance at 490 nm of several 3-fold dilutions of pooled sera. In (B) and (D), the mean IgG1 and IgG2a titers of individual sera are shown. Bars indicate geometric means. Each symbol represents one mouse. (E) Calculated IgG2a/IgG1 ratio for pooled sera. (F) Calculated IgG2a/IgG1 ratio for individual sera. Bars are means. *p < 0.05, **p < 0.01. Nonneutralizing Abs can mediate protection through various mechanisms, one being ADCC. Upon recognition of virus Ag expressed on the surface of infected cells, Abs can engage Fc receptors on effector cells such as NK cells and macrophages (31). Cytotoxic cells are then activated by cross-linking of Fc receptors and kill infected cells. 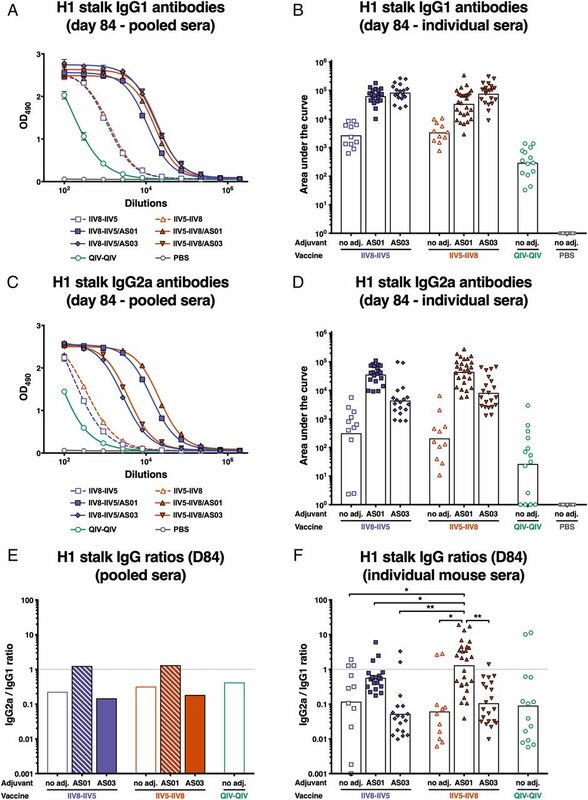 To evaluate H1 stalk-specific activity we tested pooled day-84 serum samples from vaccinated mice in an ADCC reporter assay against cH6/1N5 virus–infected cells (Fig. 6A). This virus expresses an exotic HA head domain and an NA that the mice are naive to, but it contains the same HA stalk domain as is present in the HAs of the vaccine strains. Sera from mice that received adjuvanted cHA vaccines resulted in high cell activation in the assay. Interestingly, sera from the group that received AS01-adjuvanted IIV8 followed by IIV5 resulted in the highest level of activation. This result cannot be explained by differences in HA stalk Ab binding because the group did not differ from other adjuvanted groups in HA stalk binding, be it evaluated by ELISA or IgG2a/IgG1 ratio (associated with higher ADCC activity). Thus, other factors may contribute to the observed effect. Functionality of the vaccine-elicited anti-H1 stalk Abs. After priming with QIV, BALB/c mice were immunized with different formulations, as described in Fig. 2, and the functionality of the elicited anti-H1 stalk Abs collected on day 84 was evaluated in vitro by using an ADCC reporter assay. The specific activation of effector cells against cH6/1N5- (A) or H1N1pdm09 (B)-infected MDCK cells was analyzed by the measurement of luciferase activity. Sera collected on day 84 were also pooled and transferred into naive BALB/c mice. These mice were then challenged with a lethal dose of cH6/1N5 virus (C and D) or H1N1pdm09 virus (E and F), and their weight (C and E) and survival (D and F) were monitored until recovery (16 or 14 d, respectively). To test if functional Ab activity could also be observed against a relevant human influenza virus, an additional assay was performed using H1N1pdm09 virus (Fig. 6B). Sera from all adjuvanted cHA vaccination groups showed similar activity against virus-infected cells. These findings indicate that Abs elicited by adjuvanted cHA vaccination could mediate protection via Fc-mediated mechanisms. 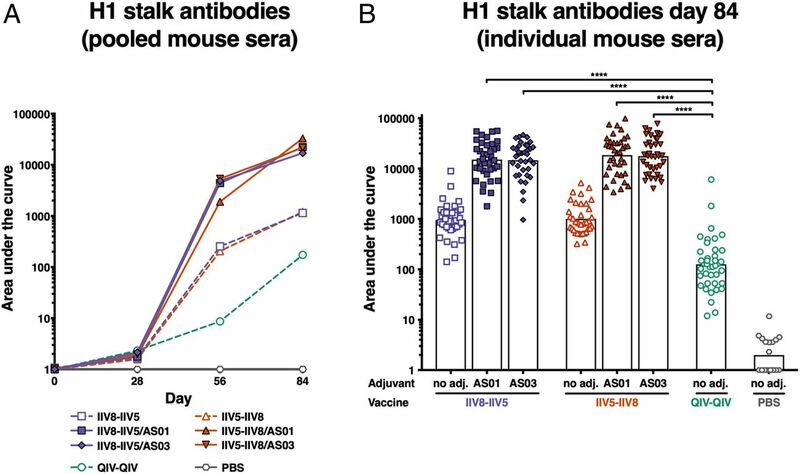 To further evaluate the functionality of the vaccine-induced HA stalk Abs in vivo, day-84 pooled sera from immunized mice were transferred to naive BALB/c mice, followed by a lethal challenge with cH6/1N5. Mice were monitored for weight loss and survival for 16 d to assess protection (Fig. 6C, 6D). No morbidity and mortality following cH6/1N5 lethal challenge was observed in mice that had received sera from mice vaccinated with adjuvanted cHA. Only partial survival was observed in mice that received sera from nonadjuvanted cHA-vaccinated animals. Thirty percent of mice that received sera from QIV–QIV-vaccinated animals survived, consistent with the overall lower HA stalk titers in these animals. To further test if this protection would also translate into protection against a virus relevant for humans, an additional serum transfer experiment was performed, followed by a stringent challenge with H1N1pdm09 virus (Fig. 6E, 6F). Although moderate body weight loss was observed after viral challenge, mice that received sera from the adjuvanted cHA vaccine groups showed 80–100% survival. The standard-of-care group that received QIV twice containing the matching strain also showed good survival after challenge (67%), but no protection was observed in groups that received sera from mice vaccinated with nonadjuvanted cHA vaccines. 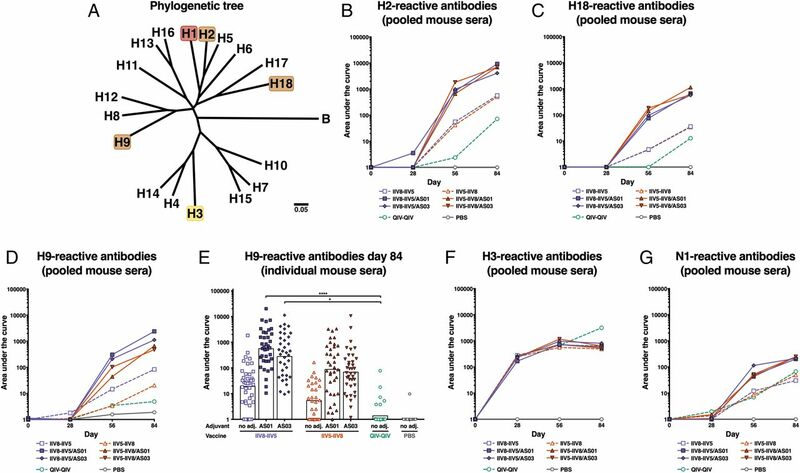 These results in the mouse passive transfer/viral challenge model demonstrated that sequential immunization with two cHA Ags (IIV5 and IIV8) may require adjuvants (either AS01 or AS03) to elicit potent protective anti-H1 stalk Abs. An additional vaccination experiment was performed in C57BL/6 mice. This mouse strain is known to show a type 1 skewed immune response to vaccination, characterized by efficient induction of Th1 and CD8+ T cell responses, and is commonly used to study cellular immunity elicited by vaccination (32, 33) (Fig. 7). 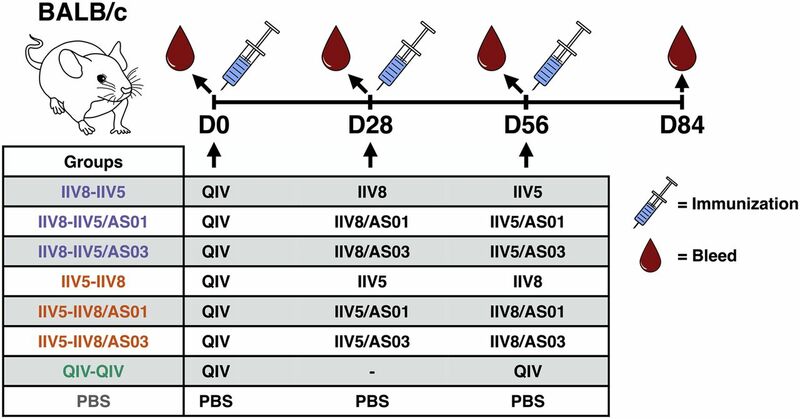 QIV-primed mice received cHA IIV vaccinations with or without adjuvant, and the T cell responses were compared with those elicited by cHA LAIV because live vaccines are known to elicit potent T cell responses. The aim was to measure the impact of adjuvant on T cell responses after immunization with IIV vaccines and the impact of the order of the immunizing doses. Spleens and lungs from five mice per group were collected 10 d after final immunization and tested by ELISPOT to measure T cell responses. Whole H1N1pdm09 virus was used to measure overall cellular responses against a relevant human virus. An irrelevant peptide was used as a negative control to test for unspecific activation. Of note, a dominant H2b-restricted epitope from the NP of PR8 (ASNENMETM) was included as an Ag for measuring specific CD8+ T cell responses. This epitope was consistent with the inactivated cHAs-expressing viruses (IIV5 and IIV8; NP from PR8) but drifted in LAIV8 (NP from A/Leningrad/134/17/57 [H2N2]) (see Table I). Because no preselection of T cell subsets was performed, all other Ags were presumed to measure both CD4+ and CD8+ T cell responses. Experimental design for cellular immunity testing. C57BL/6 mice were primed with QIV on day 0, followed by different combinations of vaccines on days 28 and 56, as indicated in Table I. T cell analysis occurred on day 66. On day 84, a subset of animals was challenged with H1N1pdm09, after which the T cell responses were analyzed on day 90. Blood samples for Ab titer determination were collected on days 28, 56, and 84. 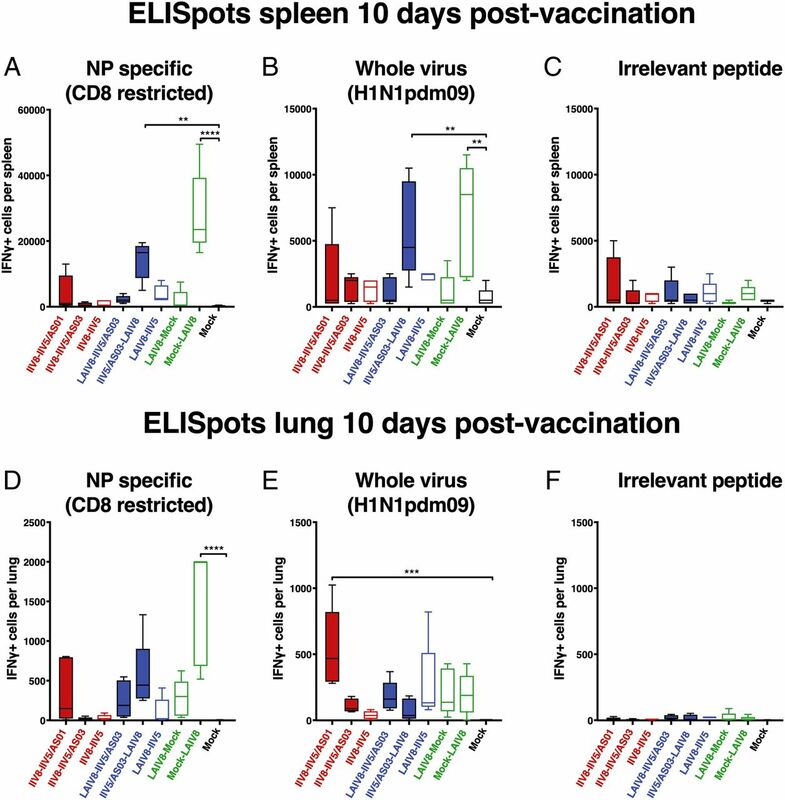 In the spleen, similar trends in responses between NP epitope– and whole virus–stimulated samples were observed, with higher responses in groups that received LAIV8 as the last booster vaccination (Fig. 8A, 8B). The number of IFN-γ–secreting cells in groups that received LAIV8 as the first booster vaccination was low, which indicates that the high levels of T cells were only transiently induced. Further, a trend of lower NP epitope–specific responses was observed in mice immunized with IIV5/AS03–LAIV8 compared with mock–LAIV8, which may mean that the immunity provided by IIV slightly reduced CD8+ T cell induction by LAIV. Overall, T cell responses in the spleen were low for groups that only received IIV formulations. A low-level response was observed in the group that received AS01-adjuvanted IIVs but was likely unspecific, as indicated by the observed reactivity to an irrelevant peptide in that group (Fig. 8A–C). IFN-γ–producing cells in the spleen and lungs postimmunization. After priming with QIV, C57BL/6 mice were immunized with different formulations, as described in Fig. 7, and the spleens and lungs of the animals were collected on day 66 to quantify the Ag-specific T cells in these organs. The cells isolated from the spleen (A–C) or the lungs (D–F) were stimulated with either the NP-derived peptide ASNENMETM (NP specific) (A and D), whole virus H1N1pdm09 (B and E), or the irrelevant peptide RAHYNIVTF (derived from human papillomavirus E7) (C and F), and the number of IFN-γ–producing cells was measured by ELISPOT. **p < 0.01, ***p < 0.001, ****p < 0.0001. Because a potential benefit of the i.n. route of administration for LAIV is the induction of local responses, T cell responses in the lungs were quantified in parallel to those measured in the spleens on day 66 (Fig. 8D–F). The number of unspecific IFN-γ–producing cells at baseline was low, indicating Ag specificity for the responses measured against influenza virus Ags (Fig. 8F). As observed for splenocytes, the number of NP-specific CD8+ T cells was the highest in the lungs when LAIV8 was given last (Fig. 8D). In contrast, when cells from lungs were stimulated with whole virus (Fig. 8E), the number of IFN-γ–producing cells was similar for all groups that were given LAIV8, independent of the timing of LAIV8 in the immunization schedule. Surprisingly, the number of activated T cells in the IIV8/AS01–IIV5/AS01 group exceeded that of all other groups upon stimulation with whole virus (Fig. 8E), whereas i.m. IIV vaccines are generally not known to elicit T cell responses in the lung. In addition to the cellular responses, H1 stalk-specific Ab levels were measured by ELISA in all groups using a recombinant cH6/1 HA (Fig. 9). The Ab response followed an expected trend similar to what was observed in the BALB/c mice. Higher levels were elicited in the groups receiving AS01- or AS03-adjuvanted IIV twice. The timing and order of LAIV8–IIV5 or IIV5–LAIV8 immunization did not impact the levels of H1 stalk-specific Abs 4 wk after the final immunization. The two groups that received a single LAIV8 immunization had the lowest Ab titers. Direct challenge and viral titers in lungs. After priming with QIV, C57BL/6 mice were immunized with different formulations, as described in Fig. 7, and the animals were challenged on day 84 with H1N1pdm09 virus. The evolution over time of the anti-H1 stalk Ab titers up to the day of challenge is shown in (A). Weight loss postchallenge was monitored for 6 d (B) up to day 90, and on day 90, lungs were collected, and the viral titers were evaluated by plaque assay (C). Bars are means. **p < 0.01, ****p < 0.0001. 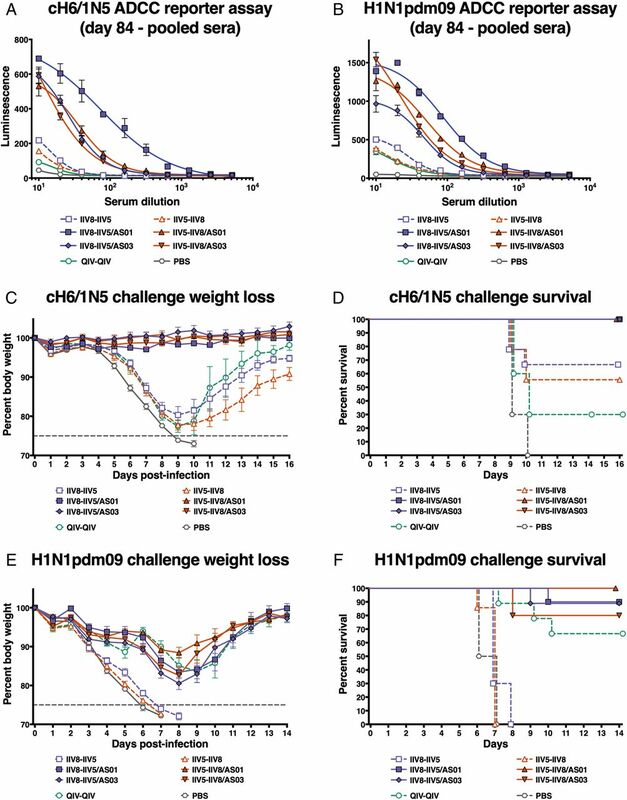 On day 84, 4 wk after the last immunization, mice were challenged with a lethal dose of H1N1pdm09 virus and monitored for weight loss for 6 d, after which tissues were collected to measure viral titers and T cell recall responses. All groups showed less weight loss compared with mock-immunized animals (Fig. 9B). Two mice in the IIV8–IIV5/AS03 group were euthanized during the vaccination series because of the development of serious and disabling skin lesions at the injection site, and thus, only data for three mice are being shown postchallenge. No similar adverse reactions were observed in the BALB/c mice used in this and previous studies, indicating that the effect may be dependent on the mouse strain (15). However, skin lesions have been reported in preclinical animal models for oil-in-water adjuvants (34). Importantly, the AS03- (and AS01-) adjuvanted cH8/1 and cH5/1 chimeric vaccines were tested in rabbits in good laboratory practice toxicity studies, and they were well tolerated at the administration site, with no unexpected local reactogenicity. In addition, AS03-adjuvanted H5N1 vaccine is approved by the U.S. Food and Drug Administration for use in humans from the age of 6 mo based on acceptable safety experience in more than 4000 persons; there is no reference to serious skin lesions in the vaccine’s prescribing information (35), nor was the risk of serious skin lesions increased in a pooled analysis of 22,521 adults who had received an AS03-adjuvanted H5N1 or H1N1pdm09 influenza or control vaccine that was performed to identify medically attended adverse events associated with receipt of AS03-containing influenza vaccines (36). Taken together, this information further indicates that this finding is an isolated incident that is likely specific for the preclinical mouse model used in the T cell studies (23) and, therefore, of little relevance to the advanced development of these vaccines. Postchallenge, mock-immunized animals had high and homogeneous viral titers in the range of 106 PFU/ml (Fig. 9C). Animals that received LAIV8 as the last immunization successfully controlled viral replication, whereas viral titers could be detected in groups that received LAIV8 as the first boost. Because the Ab levels were not different depending on the timing of LAIV8, the difference in viral titers could be due to higher levels of T cells or remaining upregulation of innate immunity (not assessed in this study). The IIV8–IIV5/AS01 group demonstrated good protection from challenge, with four mice below the limit of detection for viral titers and one in the range of 105 PFU/ml. Two mice of the IIV8/AS03–IIV5/AS03 group were lost during the serial vaccination, which limits the interpretation of data from this group. Virus replication was detected in the lungs of two out of three of the remaining mice. Additional Ags were included in the ELISPOT analysis postchallenge (Fig. 10A–E). Splenocytes and cells isolated from the lung were also tested against an HA-overlap peptide pool (H1N1pdm09). In addition, splenocytes were tested against an NP-overlap peptide pool (H1N1pdm09). These overlap peptide pools allowed the comparison of T cell responses (including both CD4+ and CD8+) against epitopes contained in viral proteins. IFN-γ–producing cells in the spleen and lungs postchallenge. After priming with QIV, C57BL/6 mice were immunized with different formulations, as described in Fig. 7, and the animals were challenged on day 84 with H1N1pdm09 virus. Their spleens and lungs were collected on day 90 to quantify the Ag-specific T cells in these organs. The cells isolated from the spleen (A–E) or the lungs (F–I) were stimulated with either the NP-derived peptide ASNENMETM (NP specific) (A and F), a pool of peptides spanning the influenza virus NP (NP overlap) (B), whole virus H1N1pdm09 (C and G), a pool of peptides spanning the H1N1pdm09 HA (HA overlap) (D and H), or the irrelevant peptide RAHYNIVTF (derived from human papillomavirus E7) (E and I), and the number of IFN-γ–producing cells was measured by ELISPOT. *p < 0.05, **p < 0.01, ***p < 0.001, ****p < 0.0001. First, we confirmed that there were no major T cell responses in the spleens of mock-immunized animals postchallenge (Fig. 10A–E), which indicates that responses measured in other groups would be recall rather than de novo primed T cell responses. The NP epitope–specific CD8+ T cell response in the spleen was generally low postchallenge, with some higher responses observed in animals that received AS01-adjuvanted vaccines (Fig. 10A). This low response could be explained by the fact that the epitope was drifted in the challenge strain compared with the vaccine strains (Table I). However, stronger responses were observed when cells were stimulated with an NP-overlap peptide pool (Fig. 10B) or with whole virus (Fig. 10C). Interestingly, the groups that received LAIV as the last immunization had low numbers of IFN-γ+ T cells in the spleen postchallenge in all conditions of stimulation (Fig. 10A–D). In contrast, the groups that received LAIV first, followed by mock or IIV/AS03 immunization, showed high IFN-γ+ cell counts when T cells were stimulated with NP overlap, whole virus, or HA overlap (Cal09) (Fig. 10B–D). The differences in recall responses may relate to the differences observed in virus replication levels (Fig. 9C). Because virus replication, and therefore viral Ag production, was largely suppressed in groups that received LAIV8 last, T cells in the spleen might not have been strongly restimulated. When groups that received only IIV were compared, a trend for more T cell activation was observed after restimulation with NP-overlap pool peptides, whole virus, or HA-overlap pool peptides for nonadjuvanted followed by AS03 and AS01 (Fig. 10B–D). This trend followed the lung virus titers, as higher lung virus titers resulted in higher T cell levels and are inversely correlated to the T cell levels in the lungs before challenge. In the lungs, the ELISPOT results showed similar activation patterns for all stimulation conditions, including stimulation with an irrelevant peptide (Fig. 10F–I). This was likely caused by actively replicating residual virus in the lungs postchallenge. Of note, animals that received adjuvanted IIV–IIV vaccines and those that received LAIV as the last immunization all showed lower levels of T cell activation compared with the other vaccinated groups. This correlated with the lung virus titers, except for the IIV–IIV/AS03 group. Influenza remains a severe threat to human health, and novel universal influenza virus vaccines are currently under development to provide better protective immunity. We have previously shown that sequential vaccination with cHAs is a viable strategy to elicit protective, broadly cross-reactive Ab responses against the HA stalk of influenza viruses. This study aimed to fill gaps in our knowledge to further support the clinical development of these vaccine candidates. We compared the effect of two different adjuvants, AS01 and AS03, on the immune response to immunization with cHA split virus vaccines. AS03 has been licensed for human use with split virus vaccines against H5N1 influenza virus (23, 37), whereas AS01 has been licensed for human use in a zoster vaccine (38). In the present work, both adjuvants potently boosted the induction of broadly cross-reactive HA stalk Abs and elicited similar levels of Ag-specific total IgG in vaccinated mice. Interestingly, AS01 induced higher levels of Ag-specific IgG2a, resulting in a higher IgG2a/IgG1 ratio, which is indicative of a Th1-focused immune response, in line with previous observations (39, 40). Importantly, we showed in this study that the Abs elicited by adjuvanted cHA vaccines were functional in an ADCC reporter assay and protected mice from lethal virus challenge. Fc-mediated functions measured in the assay and in protection were substantially boosted by both AS01 and AS03 and further support the use of adjuvants for novel universal influenza virus vaccines. A surprising finding in this study was that, although the order of cHA vaccination did not appear to have a major impact on HA stalk Ab titers, an effect was nonetheless observed in the responses measured against H9. Mice that received IIV8 followed by IIV5 had higher H9-reactive Ab levels compared with mice that received IIV5 first. Because H8 (head domain in IIV8) and H9 are within the same phylogenetic clade, it is possible that a shared epitope in the HA head domain could be responsible for the observed cross-reactivity. This phenomenon only occurred when IIV8 was given first, which could indicate that responses are further diverted toward the stalk domain and reduced against the head domain upon repeated vaccination. Original antigenic sin or antigenic imprinting against certain HA heads has been previously described in humans (41). Importantly, although the HA stalk Ab responses were measured using a cHA expressing a head domain that the mice were not exposed to, it cannot be fully excluded that some cross-reactive Abs against the HA head domain were captured in the assay. However, we have previously observed that the responses measured using the cHA probes correlate well with the responses against headless HA constructs (13). An important addition to this study was the testing of cellular immune responses elicited by cHA vaccines. A previous study in ferrets compared protection from H1N1pdm09 infection after cHA vaccination with LAIV or IIV (13). Animals that received LAIV did not show higher Ab titers compared with animals that received IIV but had lower virus titers after viral challenge. We suspected a potential contribution of T cell responses to protection. As the ELISPOT assays used in this study do not discriminate between the different sources of the quantified cytokine spots, different restimulation Ags were chosen to compare global T cell responses (including both CD4+ and CD8+) against all T cell epitopes contained in influenza virus, against epitopes in viral proteins (HA and NP), or CD8+ T cell responses against a specific (CD8+-restricted) T cell epitope after vaccination and challenge. Importantly, both CD4+ and CD8+ T cells likely contribute to the observed responses and contribute to providing protection against influenza virus infection. However, in this study, we did not tease out the specific contributions of T cell populations, and future flow cytometry–based readouts are required to investigate cell-specific responses in more detail. In this mouse study, we confirmed that LAIV can potently induce T cell responses postvaccination. However, the response was transient and decreased substantially 1 mo postvaccination. Mice that received LAIV as the last boost (4 wk before challenge) had lower T cell recall responses postchallenge and were better protected than mice that received LAIV first (8 wk before challenge). A possible explanation for this finding is that animals that received LAIV as the last boost cleared the challenge virus early on because of preexisting immunity from prior vacation, which did not lead to a further expansion or recruitment of T cells to the lung. Further studies will be necessary to separate a potential contribution of upregulated innate immunity from a waning of T cell responses after LAIV vaccination. An unexpected finding was the detection of Ag-specific T cells in the lungs of animals vaccinated with AS01-adjuvanted cHA vaccines. As inactivated split virus vaccines generally do not elicit potent T cell responses, this finding may be attributed to the presence of AS01 in the formulation, which is known to favor the activation of specific T cells (24). Whether the specific T cell activity measured in the lungs was due to circulating or resident T cells remains to be determined, because the setting of our study did not allow us to distinguish these two different T cell populations. Nevertheless, circulating T cells would be more likely to be induced because of the parenteral injection of the vaccine. QIV was only tested without adjuvant in this study as a standard-of-care control. However, it is possible that the observed effect of AS01 may also translate to seasonal influenza virus vaccines. In summary, this study demonstrates that adjuvants are needed for an optimal Ab response in the context of cHA vaccination in mice. The elicited Abs were functional and played a role in the protection against viral challenge, either through direct neutralization or Fc-mediated effects. T cells have been shown to play an active role after cHA vaccination in the context of control of virus replication, and vaccine-induced T cell responses could be recalled after viral challenge. This study also provided an extensive comparison between different vaccine regimens with different vaccine types and order of administration. These experiments further advance the development of a universal influenza virus vaccine and support the testing of the cHA vaccination strategy in clinical trials. B.B., R.N.R., R.M., M.V.d.W., B.L.I., and C.P.M. are, or were at the time of the studies, employees of the GlaxoSmithKline group of companies. R.M., M.V.d.W., and C.P.M. report ownership of GlaxoSmithKline shares and/or restricted GlaxoSmithKline shares. B.L.I. and C.P.M. are listed as inventors on patents owned by the GlaxoSmithKline group of companies. The Icahn School of Medicine at Mount Sinai has filed patents on universal influenza virus vaccines naming R.N., P.P., A.G.-S. and F.K. as inventors. The other authors have no financial conflicts of interest. We thank Irina Isakova-Sivak and Larisa Rudenko (Institute of Experimental Medicine, St. Petersburg, Russia) for help with the LAIV backbone selection. We thank Daniel Kaplan, Ariana Hirsh, and Fatima Amanat for help with protein expression and technical assistance. We also thank Alicia Solórzano for coordination and project management. Finally, we also thank Pascal Cadot (GlaxoSmithKline, Rixensart, Belgium) for scientific writing expertise in preparing the manuscript and Ulrike Krause (GlaxoSmithKline, Rixensart, Belgium) for editorial assistance and coordinating the review of the manuscript. This work was supported by GlaxoSmithKline Biologicals SA under a vaccine research collaboration between GlaxoSmithKline Biologicals SA and the Icahn School of Medicine at Mount Sinai (New York, NY). This work was also partly funded by National Institute for Allergy and Infectious Diseases (NIAID) Grants P01AI097092 (to A.G.-S. and P.P.) and U01AI124297 (to A.G.-S.), by the Center for Research on Influenza Pathogenesis, and by NIAID-funded Center for Excellence for Influenza Research and Surveillance Contract HHSN272201400008C (to A.G.-S., P.P., and F.K.). Quillaja saponaria Molina, fraction 21.
. 2013. Comparing influenza vaccine efficacy against mismatched and matched strains: a systematic review and meta-analysis. BMC Med. 11: 153.
. 2015. Advances in the development of influenza virus vaccines. Nat. Rev. Drug Discov. 14: 167–182. 2003. The annual production cycle for influenza vaccine. Vaccine 21: 1776–1779.
. 2017. Excess all-cause and influenza-attributable mortality in Europe, December 2016 to February 2017. Euro Surveill. 22: 30506.
. 2011. Influenza hemagglutination-inhibition antibody titer as a correlate of vaccine-induced protection. J. Infect. Dis. 204: 1879–1885.
. 1981. Antigenic structure of influenza virus haemagglutinin defined by hybridoma antibodies. Nature 290: 713–717.
. 2013. Genome-wide mutagenesis of influenza virus reveals unique plasticity of the hemagglutinin and NS1 proteins. Proc. Natl. Acad. Sci. USA 110: 20248–20253.
. 2018. The influenza B virus hemagglutinin head domain is less tolerant to transposon mutagenesis than that of the influenza A virus. J. Virol. 92: e00754-18.
. 2018. The influenza virus hemagglutinin head evolves faster than the stalk domain. Sci. Rep. 8: 10432.
. 2013. Influenza virus hemagglutinin stalk-based antibodies and vaccines. Curr. Opin. Virol. 3: 521–530.
. 2013. Hemagglutinin stalk-based universal vaccine constructs protect against group 2 influenza A viruses. J. Virol. 87: 10435–10446.
. 2018. A live-attenuated prime, inactivated boost vaccination strategy with chimeric hemagglutinin-based universal influenza virus vaccines provides protection in ferrets: A confirmatory study. Vaccines (Basel) 6: 47.
. 2017. A universal influenza virus vaccine candidate confers protection against pandemic H1N1 infection in preclinical ferret studies. NPJ Vaccines 2: 26.
. 2015. Hemagglutinin stalk immunity reduces influenza virus replication and transmission in ferrets. J. Virol. 90: 3268–3273.
. 2016. A chimeric haemagglutinin-based influenza split virion vaccine adjuvanted with AS03 induces protective stalk-reactive antibodies in mice. NPJ Vaccines 1: 16015.
. 2018. Distinct and complementary roles of CD4 T cells in protective immunity to influenza virus. Curr. Opin. Immunol. 53: 13–21. 2016. Heterosubtypic T-cell immunity to influenza in humans: Challenges for universal T-cell influenza vaccines. Front. Immunol. 7: 195.
. 2008. Immunomic analysis of the repertoire of T-cell specificities for influenza A virus in humans. J. Virol. 82: 12241–12251.
. 2014. Preexisting CD8+ T-cell immunity to the H7N9 influenza A virus varies across ethnicities. Proc. Natl. Acad. Sci. USA 111: 1049–1054.
. 2016. Influenza A viruses expressing intra- or intergroup chimeric hemagglutinins. J. Virol. 90: 3789–3793.
. 2012. Influenza viruses expressing chimeric hemagglutinins: globular head and stalk domains derived from different subtypes. J. Virol. 86: 5774–5781.
. 2016. Evidence update: GlaxoSmithKline’s inactivated quadrivalent influenza vaccines. Expert Rev. Vaccines 15: 201–214.
. 2012. Development and evaluation of AS03, an Adjuvant System containing α-tocopherol and squalene in an oil-in-water emulsion. Expert Rev. Vaccines 11: 349–366.
. 2017. Adjuvant system AS01: helping to overcome the challenges of modern vaccines. Expert Rev. Vaccines 16: 55–63.
. 2012. A carboxy-terminal trimerization domain stabilizes conformational epitopes on the stalk domain of soluble recombinant hemagglutinin substrates. PLoS One 7: e43603.
. 2013. Expression of functional recombinant hemagglutinin and neuraminidase proteins from the novel H7N9 influenza virus using the baculovirus expression system. J. Vis. Exp. 6: e51112.
. 2012. Single and coexpression of CXCR4 and CXCR5 identifies CD4 T helper cells in distinct lymph node niches during influenza virus infection. J. Virol. 86: 7146–7157.
. 2000. Direct ex vivo kinetic and phenotypic analyses of CD8(+) T-cell responses induced by DNA immunization. J. Virol. 74: 8286–8291.
. 2008. Control of virus-specific CD8+ T-cell exhaustion and immune-mediated pathology by E3 ubiquitin ligase Cbl-b during chronic viral infection. J. Virol. 82: 3353–3368.
. 2016. Age dependence and isotype specificity of influenza virus hemagglutinin stalk-reactive antibodies in humans. MBio. 7: e01996-15.
. 2017. Alveolar macrophages are critical for broadly-reactive antibody-mediated protection against influenza A virus in mice. Nat. Commun. 8: 846.
. 2016. Increased protein degradation improves influenza virus nucleoprotein-specific CD8+ T cell activation in vitro but not in C57BL/6 mice. J. Virol. 90: 10209–10219.
. 2013. Improved adjuvanting of seasonal influenza vaccines: preclinical studies of MVA-NP+M1 coadministration with inactivated influenza vaccine. Eur. J. Immunol. 43: 1940–1952. 2005. Adjuvants and antibody production: dispelling the myths associated with Freund’s complete and other adjuvants. ILAR J. 46: 280–293. Food and Drug Administration. 2013. Prescribing Information for Influenza A (H5N1). Virus Monovalent Vaccine, Adjuvanted. Available at: https://www.fda.gov/downloads/BiologicsBloodVaccines/SafetyAvailability/VaccineSafety/UCM376464.pdf. Accessed: April 4, 2019.
. 2014. Safety of AS03-adjuvanted inactivated split virion A(H1N1)pdm09 and H5N1 influenza virus vaccines administered to adults: pooled analysis of 28 clinical trials. Hum. Vaccin. Immunother. 10: 2942–2957.
. 2018. Correlates of adjuvanticity: A review on adjuvants in licensed vaccines. Semin. Immunol. 39: 14–21.
. 2018. Development of adjuvanted recombinant zoster vaccine and its implications for shingles prevention. Expert Rev. Vaccines 17: 619–634.
. 2017. Cellular and molecular synergy in AS01-adjuvanted vaccines results in an early IFNγ response promoting vaccine immunogenicity. NPJ Vaccines 2: 25.
. 2014. Enhancement of adaptive immunity by the human vaccine adjuvant AS01 depends on activated dendritic cells. J. Immunol. 193: 1920–1930.
. 2018. Harnessing immune history to combat influenza viruses. Curr. Opin. Immunol. 53: 187–195.